The 416 Fire burned in a mosaic pattern, leaving some stands of trees. A flash flood watch is in effect for the 416 Burn scar area Saturday and more rain is predicted in the next few days. La Plata County has issued pre-evacuation notices for areas south of the 416 Fire burn scar. The risk of flooding near the 416 Fire is expected to persist Saturday. The National Weather Service issued a flash flood watch for the 416 Fire burn scar from noon until 9 p.m. Saturday. 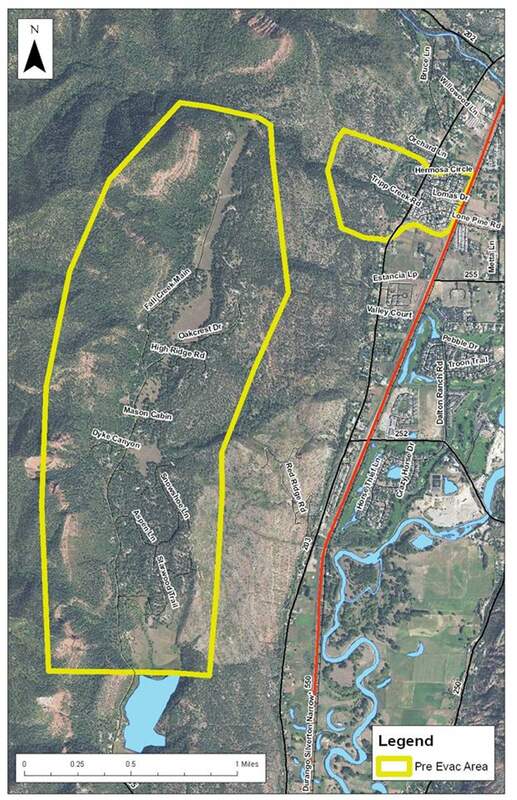 The potential for flooding prompted a pre-evacuation notice Friday night for 317 homes near the southern end of the fire in the Tripp Creek, Dyke Canyon, Hermosa Circle and Falls Creek Ranch areas, according to a La Plata County news release. The pre-evacuations notices are expected to stay in place as long as there is a risk of flooding, said Megan Graham, a spokeswoman for the county. Saturday, scattered storms could bring up to an inch of rain in some areas and soils in the burn scar are likely to have difficulty absorbing the precipitation, said Julie Malingowski, a meteorologist with the National Weather Service. “The soils of the burn scar are extremely susceptible to sliding,” she said. The area could see afternoon thunderstorms through the middle of the week, according to NWS. Friday night, areas just west of Durango received an inch of rain, while some areas to the east of town didn’t receive any precipitation, Malingowski said. 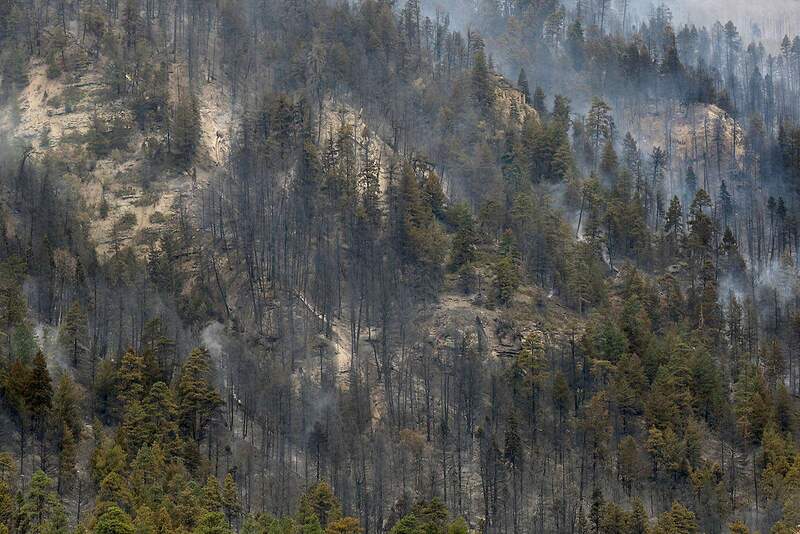 The scattered storms Friday did not trigger any flooding near the burn scar, said Becky Shufelt, a spokeswoman with the National Incident Management Organization handling the 416 Fire. “I just don’t think we’ve gotten enough rain to really warrant flooding conditions,” she said. The rain did help to quench the 54,129-acre fire, which has reached 50 percent containment and is no longer expanding, she said. “All we’re seeing within the fire perimeter is just smoldering of the heavier fuels that will most likely continue to burn until the snow flies,” she said. The hot spots are on the fire’s western side in, or near, wilderness areas, she said. The cooler, wet weather has allowed crews to focus on fire suppression repair and they are making good progress, she said. Hand lines and dozer lines leave marks across the landscape, so the majority of the work will be repairing those lines. Crews have also gathered more than 160 miles of fire hose and more than 100 water pumps and other fire equipment, she said. Crews and other resources are continuing to leave the fire each day for higher priority fires, she said. There are 338 people currently working on the fire. “Each day that passes by, we are downsizing quite a bit,” she said. On Wednesday, NIMO expects to hand over command of the fire to local officials, she said. Local officials are also managing the flood risk and they expect to present results of a study that examined which areas in the burn scar face the highest risk during a public meeting at 7 p.m. Saturday at Miller Middle School, 2608 Junction St.